We are one of the leading Manufacturers, Exporters and Suppliers of Dyestuffs in India. Formulated from premium ingredients that are mixed in an advanced agitation plants, our Dyestuffs are reckoned for their color quality fastness and durability. Buyers can purchase Dyestuffs from us at market leading prices and expect timely delivery. We offer them in Yellow, Red, Blue, Cyan, Magenta and many other colors. 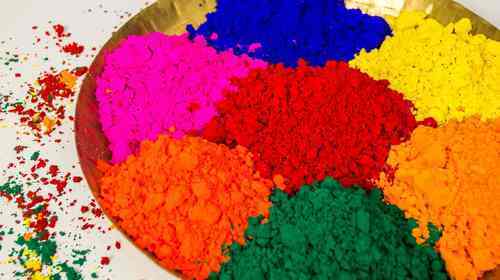 Our Range : Reactive Dyes, Acid Dyes, Acid Metal Complex Dyes, Direct Dyes, Disperse Dyes, Solvent Dyes (Powder & Liquid), Metal Complex Solvent Dyes, Basic Dyes, Vat Dyes, Mordant Dyes, Fast Bases - Salts, Food Colour, Biological Stains (Microscopic Dyes ), pH Indicators, Hair Dyes, Salt Free Dyes (for Inkjet & Textile Printing), Liquid Dyes, Leather Dyes, Optical Whitening Agent, Organic Pigments, Pigment Paste, Ultramarine Blue, Food Colour, Natural Food Colours, Cosmetics Colours & Dyes, Dyes Intermediate.